I took this yesterday from Cape Paterson on the south coast of Australia. 30 60 sec subs with an unmodified Canon 760D and Starwave ED70. Last edit: 5 months 1 week ago by michael_murphy. After one look at this planet any visitor from outer space would say; "I WANT TO SEE THE MANAGER". How green is that comet, Michael? They must make comets in Connemara. 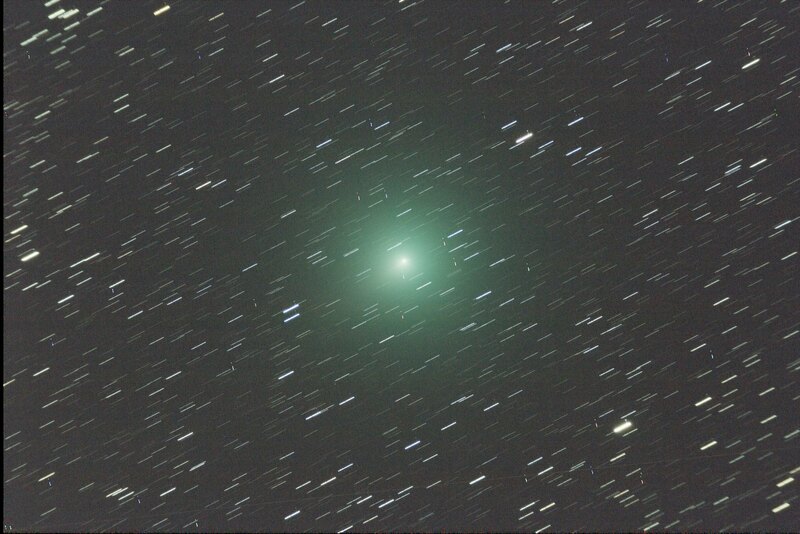 There is quite a lot of hype about Comet Wirtanen. We might see it for Christmas in Ireland. The hype around this comet will be the usual misinformed tabloid stuff. The reality is that it could reach mag +3, but with a large coma meaning it's true brightness will be dimmer than that. Still possible naked eye object. 2 key encounters for it - Pleiades on the 16th and Capella on the 23rd. Starting to write the December guide. 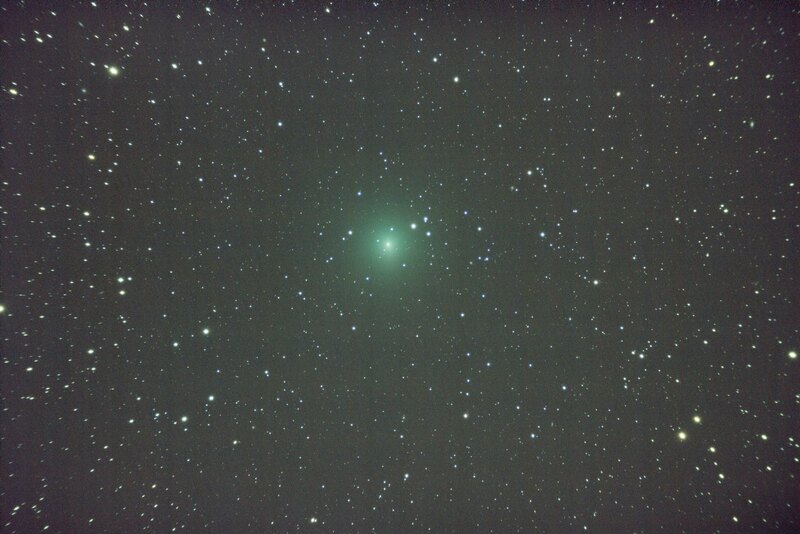 The newly discovered comet C/2018 V1 (Machholz-Fujikawa-Iwamoto) is currently mag +8 and has a very short observing window for those in the Northern Heimsphere before it gets too close to the sun and heads South, disappearing from view. It is in Virgo and visible from 06:00. Last edit: 5 months 1 week ago by Neill. Here's an image taken last night (5th Dec). 30 60 Sec shots. The comet has sped up and brightened somewhat since my last picture. Last edit: 4 months 2 weeks ago by michael_murphy. Went looking for it last night - just a fuzz ball visible in binoculars....but visible all the same. 6th pm Azha (Eta (η) Eridani, mag +3.9). 10th pm Menkar (Alpha (α) Ceti, mag +2.5). 12th pm Omicron (ο) and Xi (ξ) Tauri, mag +3.6 and +3.7 respectively. 16th pm M45 – The Pleiades. 17th pm Psi (ψ) Tauri, mag +5.2. 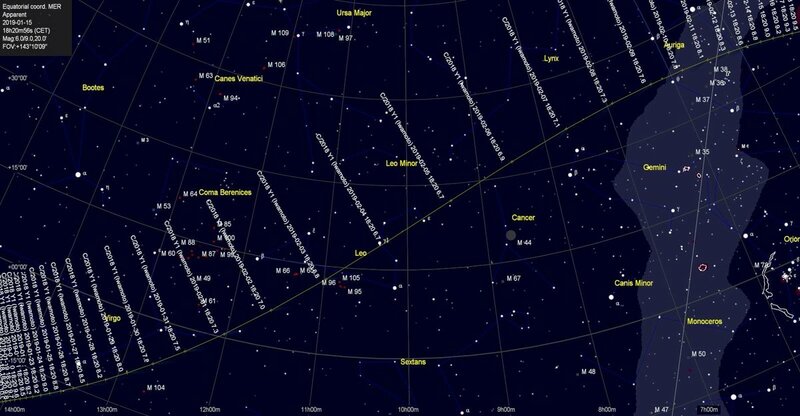 22nd pm Almaaz (Epsilon (ε) Aurigae, mag +3.0). 23rd pm Capella (Alpha (α) Aurigae, mag +0.1). 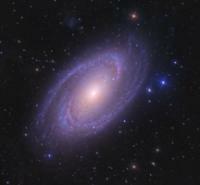 I observed it using a 120mm refractor on Mon night and it was very disappointing. Admittedly it was from a suburban location with lots of light pollution, but the comet was just a faint smudge. Here's hoping it will improve as it climbs higher in the sky and brightens further. It is naked eye now, a least from my rural site. Magnitude estimate is difficult because of the large coma, but by comparison with nearby 94 Cet and 10 Tau I would settle for +4.6. First naked eye comet I've seen since Lovejoy in February 2015. Last edit: 4 months 21 hours ago by Neill.